East Liberty’s Teen Book Club: What will we read next?? Once a month, since the fall, a small group of teens has been meeting at East Liberty to discuss books. As the book discussion facilitator, I think you should think about joining us. You never know what will come up in a book discussion. So far we’ve read Of Mice and Men by John Steinbeck, Ship Breaker by Paolo Bacigalupi, Panther Baby by Jamal Joseph, and a smattering of poetry, including some of Anne Sexton’s takes on Grimm’s Fairy Tales in her Transformations. We’ve talked about whether the American Dream is essentially depressing, how the world might look in 10-20 years time, the politics of the late 60s in America and why there’s not a Black Panther Party today, community service, and the difference between “bird sitting on a branch” poetry and poetry you might want to read. Books are a great place to start from if you want to end up talking about anything and everything. Next month we will be reading Ready Player One by Ernest Cline. This is a story of a puzzle quest in an immersive online world, called OASIS, coded and put together by a reclusive computer genius obsessed with the culture of the 1980s. Whoever solves his puzzle – by successfully collecting 3 keys– will inherit a giant fortune. Five years after the announcement of the puzzle, and the genius’s death, the first key is found by a teenager in Oklahoma City. And the race is on. So put your copy on hold today and discuss with us on Saturday, March 16th at 2 pm. 80s music and snacks provided. -Tessa, CLP – East Liberty. CLP-Lawrenceville is now re-open for business! After a six-week closure, all staff is back from our temporary homes and we are ready to show off our newly spruced- (and still sprucing-) up branch. While work is not entirely complete, the changes look promising and fabulous. I made several years ago. 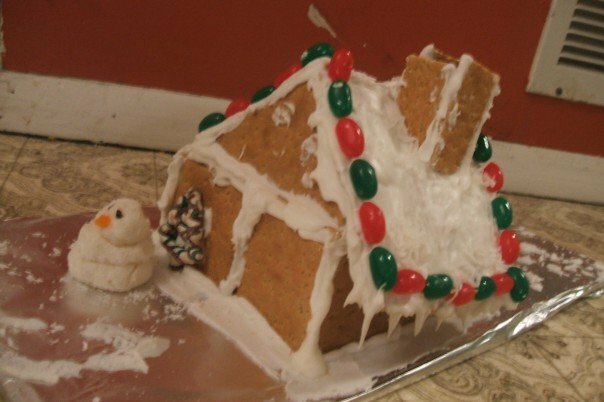 Join us for the Holiday Party and make your own house! Posted on October 29, 2012 by Corey W.
Recently, while scanning through Netflix Instant’s “New Releases,” I found a documentary that piqued my interest called “Indie Game: The Movie.” Indie Game is about the burgeoning independent video game biz and it follows the development of two games: Super Meat Boy and Fez. These aren’t your typical multi-million-dollar-budgeted blockbuster games like Halo or Call of Duty, they’re personal projects painstakingly designed and coded (often by just a couple of people), where ingenuity in gameplay takes precedent over flashy graphics. The budgets for these games are small, too, and most of them don’t have big publishers like SquareSoft or Bethesda to promote them after the game is finally complete. The movie does a great job of communicating the passions and frustrations of these game designers. And though I consider myself a life-long gamer (chronologically from Rogue on my first PC in the 80s, to the NES, Sega Genesis, N64, PlayStation 2, and, now, Playstation 3, with plenty of other PC upgrades and games along the way) I never really knew how games like these were made. Indie Game gives you a peak inside that process through interviews with journalists and such indie game luminaries as Phil Fish (Fez), Jonathan Blow (Braid), and Edmund McMillen and Tommy Refenes (Super Meat Boy). If the creators of Fez and Super Meat Boy are anything like other indie game designers (and I think they are), the process seems to include a lot of late nights, coding, poor nutrition, legal battles, and stress. But they make really cool games. This documentary is about more than the steps it takes to create a independent video game, it’s about gaming as an art form and a way of life. These guys grew up on classic games like Super Mario Bros. 3 and the Castlevania series; they want to contribute to the artform that captured their attention as kids. As they attempt to, you can see them struggle with creating just as a writer or painter might. They’re fighting to make their dreams tangible, and then, struggling to accept the opinions of the critics and gamers who suddenly have access to a part of them. If you’re into gaming as a hobby or a possible career choice, or you just want to watch an interesting documentary, I suggest clicking over to Netflix and giving Indie Game a shot. Beyond the story that Indie Game tells, there are indie video games themselves–they’re really worth checking out. Most are available as downloadable titles through X-Box Live Arcade, the Playstation Network, and the Wii Shop. X-Box currently has the best lineup of indie titles, but the Playstation Network is offering more all the time. Limbo (platform: PS3, XBox 360, PC) – LIMBO, a black and white puzzle-platforming adventure, puts players in the role of a young boy traveling through an eerie and treacherous world in an attempt to discover the fate of his sister. I have a confession to make. I am a video game addict. I actually had to disconnect my Playstation because I was staying up til 3 or 4 in the morning playing Madden. It’s been over 5 years since I touched a video game system, but I think my streak will end in one week when Assassin’s Creed 3 is released. I feel like this game was created just for me as it combines some of my favorite interests: early American history and first-person shooters. I bet you didn’t even know that you can use your library card to get video games! The library has hundreds of video games available. Some of my favorites are Medal of Honor Airborne, Madden NFL ’12, and NHL ’12. The historical setting of Assassin’s Creed 3 has always been one of my favorite topics to read about, too, so that makes it especially exciting for me. The revolutionary war period was turbulent, violent, and a lot of it happened right around Pittsburgh. There are a lot of great books about this era; some of my favorites are: Wilderness Empire by Allan Eckert, Patriots: the Men Who Started the American Revolution by AJ Langguth, and 1776 by David McCullough. We are also lucky to have the Fort Pitt Museum right here in Pittsburgh! This is a great spot where you can learn about the French and Indian War and other aspects of colonial history. Posted on August 6, 2012 by Corey W.
Hi, I’m Henry. Since I was born 16 years ago, my biggest claim to fame has been winning the state geography bee in 2009. I run cross country and track for Seton-La Salle High School. I play trombone in the school’s marching band and am a member of the Mock Trial and Academic Games teams. I like to read the Greeks and Romans, and I love opera. The stage was dominated by a very large screen suspended over the orchestra’s chairs. When the conductor, a Ms. Eí mear Noone began the music, the screen showed screenshots from different games of the Zelda franchise. The images on the screen evoked laughter from time to time among the audience in general, but I, having never played a game in the franchise, was not sure when and why to laugh. At the beginning of the symphony, I resented the screen as an unnecessary distraction; by intermission, I was curiously mesmerized by it. It was a very different experience from when I’ve been there for more conventional works. I think it would be detrimental to some works whose music is attractive enough to sustain interest (in my case, music of Mozart and his generation); for others which I do not care for as much (e.g., Bruckner, Debussy, Wagner, etc.) it would almost certainly hold my attention better. The music itself presented, I think, did not need such sideshows. It was, as is much video game music, catchy and facile (in the best sense of that word). The main theme was repeated innumerable times, but not ad nauseam. The style of the music defied categorization, but I would call it modern if I had to call it anything. My personal favorites were the first two movements, which were respectively descriptive of a dungeon and a pastoral village in the universe of Link and Zelda. In its entirety, I thought the show was better than average, and not merely for the novelty of the staging or the unusual music (or, perhaps, in spite of them). The quality of the music was overall very good, and, as usual, the Pittsburgh Symphony Orchestra showed us the reasons why it is so highly acclaimed.